Last weekend I had the honor of hosting a baby shower for my BFF of 22 years, Jacque! This shower was SO much fun to put together! 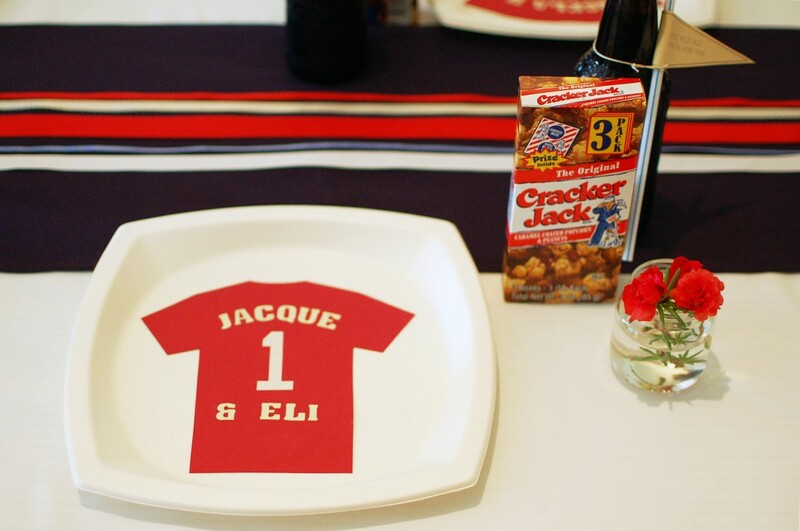 We had peanuts and Cracker Jack, of course, as well as other baseball staples like hot dogs (in striped trays!) and nachos. 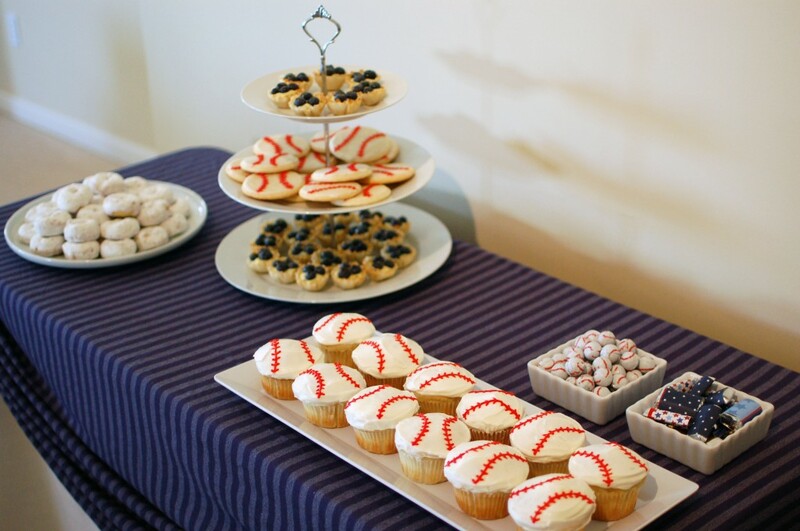 Desserts included baseball cupcakes, cookies and chocolates, plus donuts and blueberry tarts. 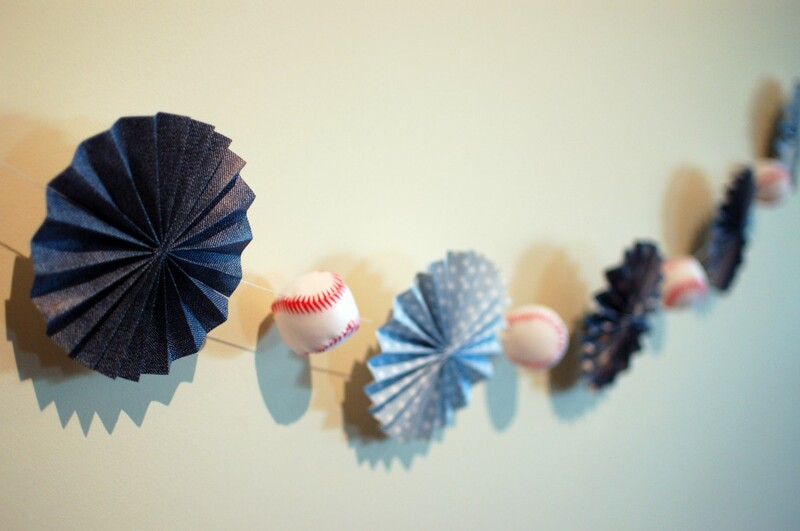 I made a rosette-and-baseball banner (DIY details to follow) for the dessert table that Jacque could also take home and hang in the nursery. 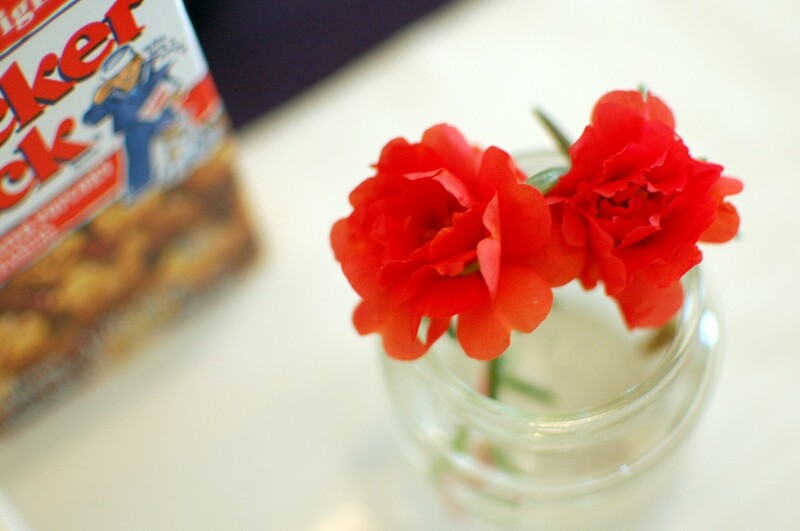 Each place setting featured a box of Cracker Jack, a bottle of root beer, flowers in a baby food jar (I love baby food jars even when it isn’t a baby shower!) 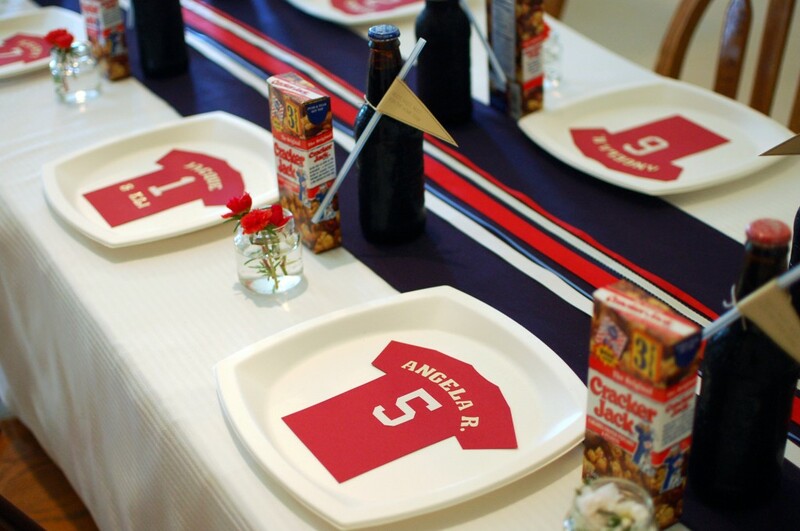 and a jersey with the guest’s name. 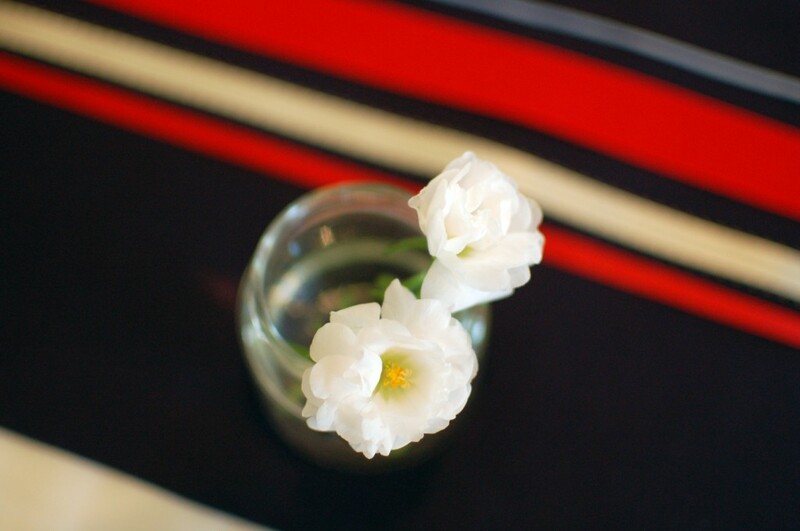 My mom (and co-hostess) whipped up the ten foot table runner from navy fabric she had on hand, and I topped it with red, white and blue ribbons. 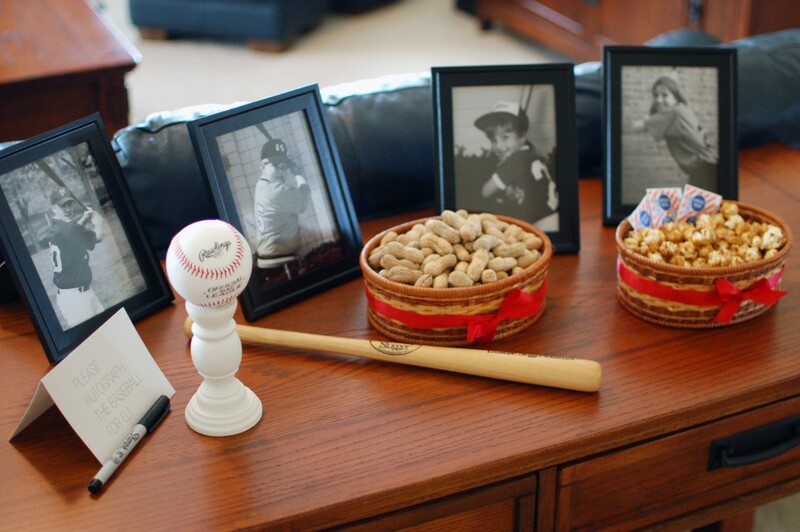 I framed some childhood photos of the parents-to-be in their baseball poses (a perk of putting together their wedding slideshow: I already have all their old photos!). The setup was perfect — since one is right-handed and the other left, their photos are mirror images! 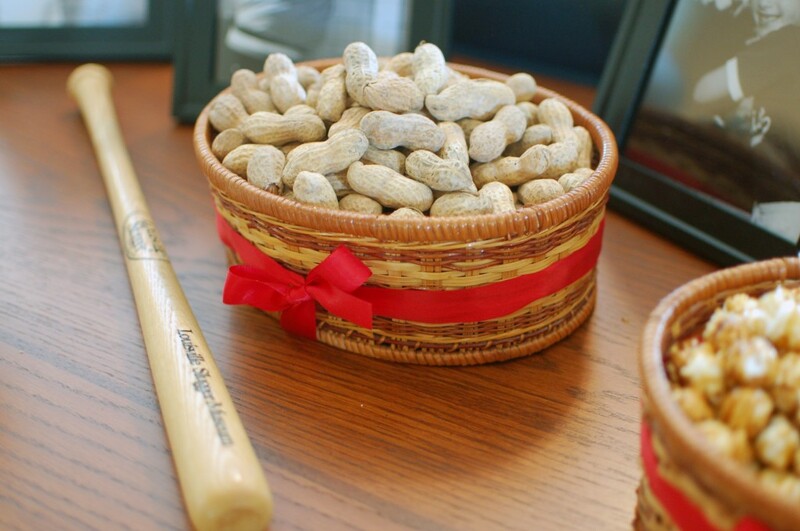 I also added a mini bat (thrift store find) and a baseball for the guests to autograph for the baby. 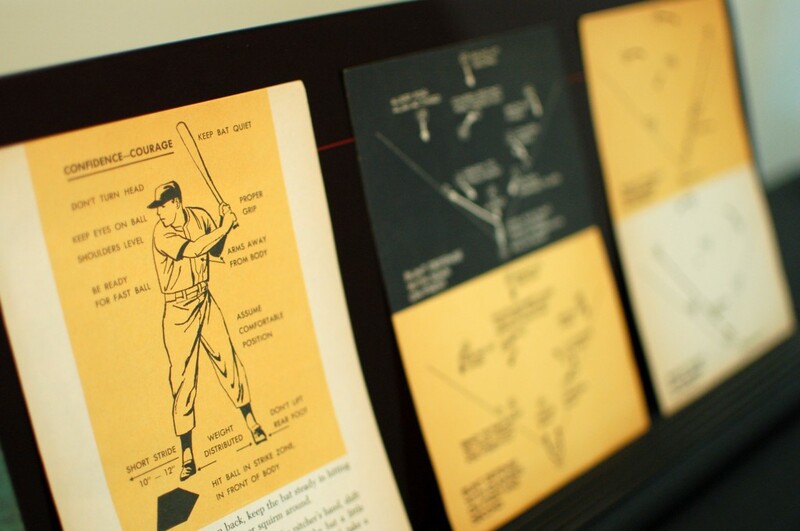 Other baseball decorations included pages from an old baseball book (thrift store find), and a clothesline of baseball baby clothes, mostly featuring the St. Louis Cardinals. Seems like my mom brought home a new Cardinals baby item every day leading up to the shower! In lieu of traditional games, we had onesie decorating station. 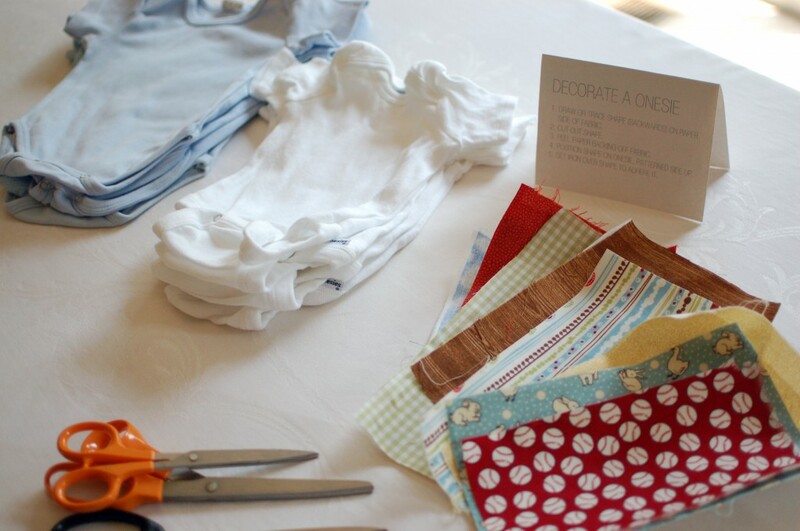 Guests could pick out their favorite fabric, cut out a shape and iron it onto a tiny outfit. 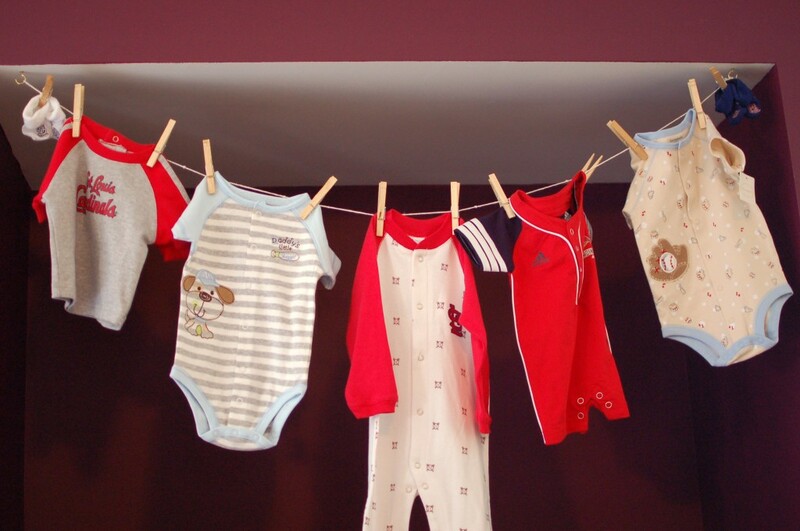 The super cute finished onesies were strung from a clothesline over the gifts — a very custom bit of decor and wearable keepsakes for the baby! 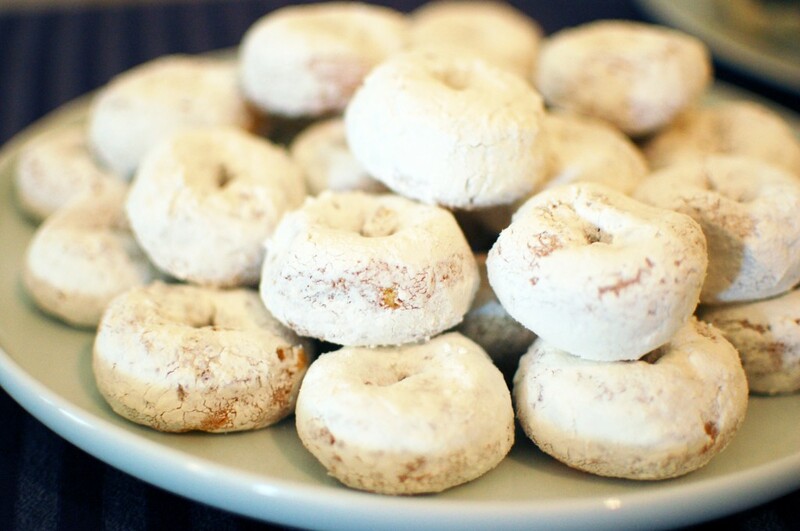 We had a wonderful afternoon of chatting, eating, crafting, gifting and celebrating! Now I just have to wait patiently to meet the all-star in person this fall! Everything looked too cute and so creative! Jacque is certainly fortunate to have such a friend. 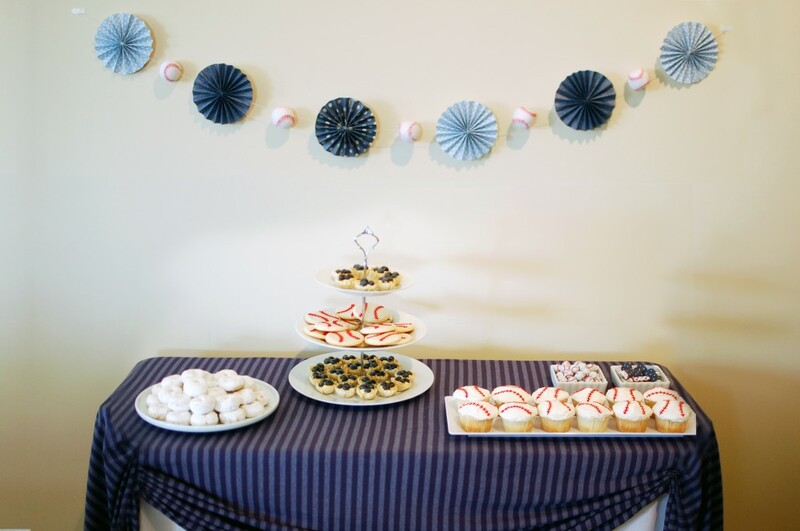 You did an awesome job thinking up all the decorations and then putting it together to make an great party for Jacque. I want the directions for decorating a onese! Can you email me them? 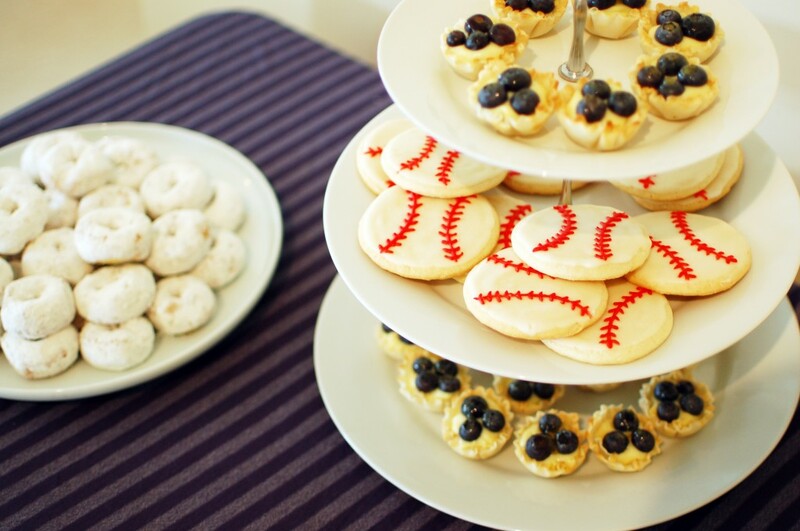 I love these ideas…as you can see I’m a Baseball Mom! UGH…never mind! I just saw them! Thanks!! 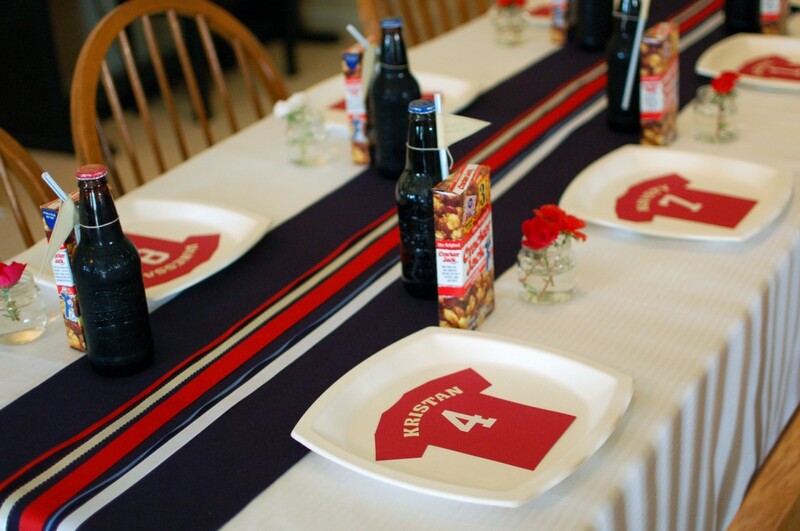 How did you make the jerseys on the plates? You did an awesome job! 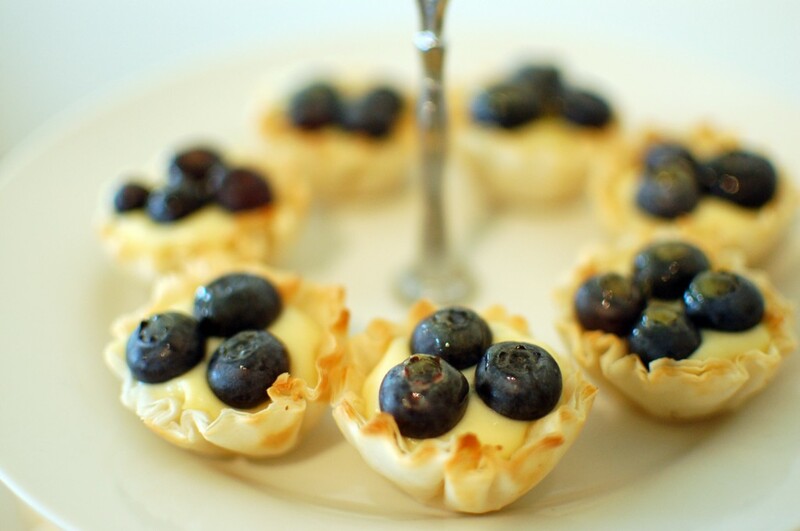 I am curious about the plates – how did you do that?